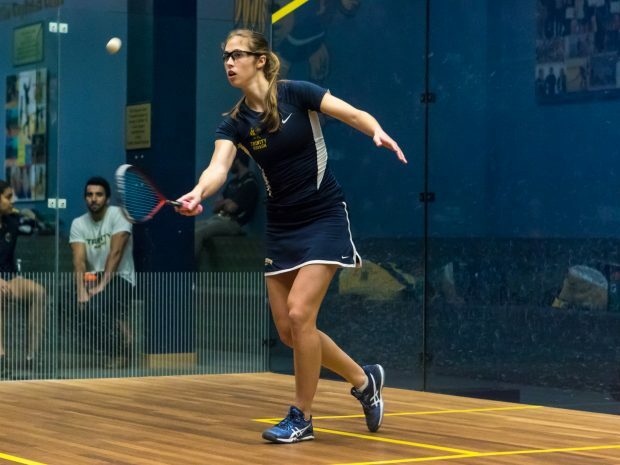 The Trinity College Women’s Squash season came to a heartbreaking halt in the Howe Cup Semifinals on Saturday as they were edged by the Penn Quakers, 5-4, for the second time this season. While their quest to capture the National Championship fell short, the Bantams finished the 2017 campaign on a high note with a 7-2 victory over the tournament host Princeton Tigers in the third place match on Sunday. The No. 3 Bantams cruised through their quarterfinal matchup on Friday, sweeping the Stanford Cardinal 9-0 for the second time this season. The victory improved the team’s record to 16-2, with the only losses coming against their semifinal opponent, Penn, and their would-be final opponent, Harvard. The Quakers narrowly defeated the Bantams in Philadelphia on Jan. 16th, coming back from a 3-4 deficit to beat Trinity 5-4. Nonetheless, the team felt confident that they could compete with Penn and ultimately beat them should they meet again. In the rematch with the Quakers, the Bantams got off to a perfect start, sweeping the first wave of matches 3-0, with victories from Vanessa Raj ’20, Julia LeCoq ’18, and Korolina Holinkova ’18, at the No. 3, 6, and 9 spots, respectively. All three matches were highly contested; Raj and LeCoq each needed five games to close out their victories, while Holinkova closed her match out in four. Unfortunately, the second set saw a resurgence from the Quakers that knotted the match back up and 3-3. Salma Defrawy ’18 and Lakeesha Rarere ’20 both fought to a fourth game, but were ultimately bested. With the overall match locked up at three matches apiece, Jenny Haley ’19 captured a crucial victory to put the Bantams within a match of the Howe Cup Finals. Not only did the win put the Bantams back in front but it also avenged Haley’s only loss of the season against Rowaida Attia Walid. Ultimately, though, the Bantams fell to the Quakers in another heartbreaking match. However, they had to bounce back on Sunday to play their third place matchup with No. 4 Princeton. Just a week prior, the Bantams downed the Tigers 8-1 at the Kellner Squash Courts in their last home match of the season, and their third place bout was not much different. The Bantams finished the 2016-2017 campaign with a 7-2 victory, highlighted by victories from the top seven players on the ladder. Raneem Sharaf ’18 captured a 3-1 victory at No. 1 in the final match before her senior season, and Salma Alam Eldin ’20 finished a stellar freshman campaign with a 3-0 win. Captain Anna Kimberly ’17 capped her illustrious career with a thrilling 3-2 victory at the No. 2 slot in her final match as a Bantam. While the team did not achieve its ultimate goal of recapturing the Howe Cup, it had a tremendous season, finishing with a record of 17-3. While the Bantams lose the only four players with Championship experience to graduation – Kimberly, Alexia Echeverria ’17, Phoebe Carlisle ’17, and Brice Rothenberg ’17 – they will certainly be in the championship mix in 2018. The team returns eight of its top nine players, and a new crop of freshmen is certain to bolster the lineup even further.